NASA’s Wide Field Infrared Survey Explorer (WISE)identified 107 potentially hazardous asteroids (PHA) that cross Earth’s orbit as of 2012 (Credits: NASA). The Chelyabinsk meteorite shower on February 15 stressed the necessity of revitalized international cooperation efforts on detection and diversion of near Earth objects (NEOs). The Scientific and Technical subcommittee of the United Nations Committee on Peaceful Uses of Outer Space (COPUOS) discussed that very issue February 11-22 at a prescheduled meeting that only fortuitously coincided with the biggest meteor strike in 100 years and the closest recorded asteroid flyby in history. The Action Team on Near-Earth Objects of the UN Office for Outer Space Affairs (UNOOSA) recommended founding an International Asteroid Warning Network (IAWN) to detect hazardous NEOs, identify their trajectories, and spread early warnings of potential collisions. “This event in Russia and the pass of the larger asteroid 2012 DA14 are good reminders that many thousands of objects like it pass near Earth daily,” said Ray Williamson, a senior adviser to the Secure World Foundation. 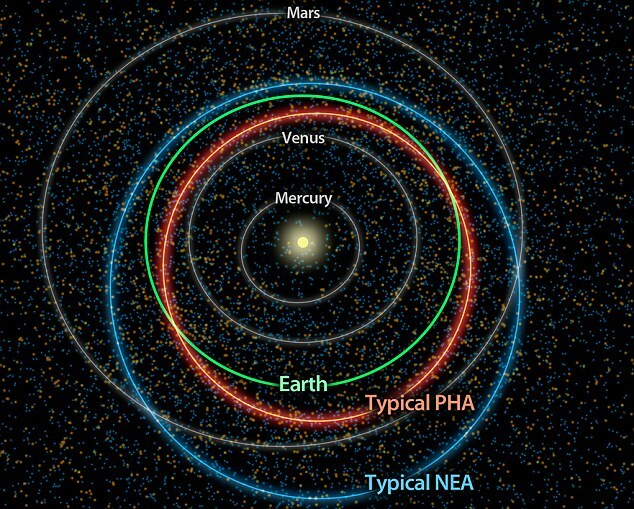 The Earth’s atmosphere protects us from most NEOs smaller than 40 m diameter, [..] From this size up to about 1 km diameter, an impacting NEO can do tremendous damage on a local scale. Above [..] 2 km diameter, an impact will produce severe environmental damage on a global scale. A global NEO strategy would ideally include preventive measures such as changing NEOs’ orbits, and pre and post impact measures, such as disaster preparedness and impact recovery planning. These activities involve numerous political considerations of various natures; international coordination has a ways to go before meeting the need. 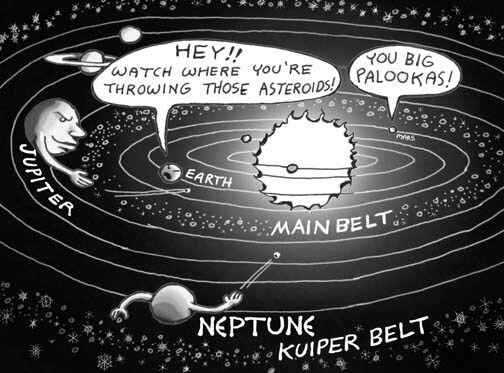 The gravitational interactions of the gas giants significant effect asteroid and Kuiper belt object ortbis (Credits: Origin unknown). According to Professor Crowther, chair of the UN Working Group on Near Earth Objects, “We have to decide on a political framework, who’s going to act and under what authority. That’s clearly a role for the UN within the next two to three years. The key is to get it done before it’s needed, when people are much more reasonable, rational and objective.” Crowther concluded that the scientific consensus is already broadly in place, but political consensus may take longer. UN COPUOS will decide whether to endorse the Scientific & Technical subcommittee NEO planetary defense recommendations at the next committee meeting in June 2013.